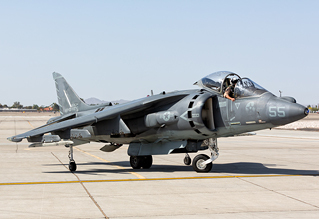 The Marine Corps Air Station at Yuma is home to a number of squadrons flying the AV-8B Harrier II, F-5E Tiger II and the newest residents, the F-35B Lightning II. Yuma is to be found in the far southwest corner of Arizona, just 24 kilometres north of the Mexican border. The Air Station itself lying to the south of the city centre and is just off the I8 making it a two and half hour drive from San Diego or three hour drive from Phoenix. MCAS Yuma is a joint civilian-military airport with Yuma international airport. The civilian side of the airport continuing to operate during the show, causing brief gaps between the airborne displays as passenger aircraft arrived and departed. 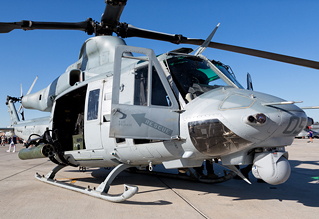 Keith Meachem attended the 52nd MCAS Yuma Airshow & Open House. Gates opened at 08:00, with the flying display taking place between 11:00 and 15:45. Parking was either off site (free) meaning you were bussed in, or you could pay to park on base and then walk onto the ramp. Being an open house, there was plenty of food and drink on hand, with the USMC providing water bowsers to top up water bottles during the day. You couldn't ask for better weather conditions with clear blue skies and temperatures in the mid 80s which meant applying plenty of sunscreen though out the day. However, as the day progressed the winds strengthened from the north, which caused a number of changes to the schedule. 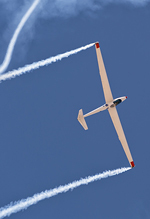 The static aircraft were grouped to the north of the showground and showcased most of the UMSC's current fixed-wing and rotary-wing aircraft. 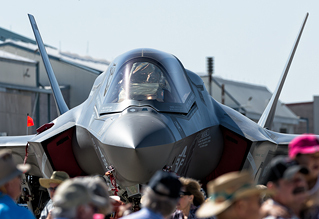 Like most US shows there were no barriers around the aircraft, the one exception being the F-35B. The static aircraft were well supported by their crews who were more than happy to allow the public access to their aircraft, with long queues forming to walk through the Osprey, CH-53, Hercules etc. The flying display was a mixture of Military and civilian aircraft and lasted for nearly four and a half hours. The flying display was opened by Yuma's Marine Corps Adversary squadron (VMFT-401) in 4 x F-5E Tiger IIs. MCAS Mirama was represented by the VMM-363 (Lucky Red Lion) who demonstrated their MV-22. Even though it has been in service for several years, it’s still an impressive sight to see an Osprey transition through its different flight modes showcasing its VSTOL capabilities. There were a number of fun displays to cater for the family audience. The first was Roger Buis and “OTTO The Helicopter” flying a Schweizer 300C performing numerous tricks, showing off some great airmanship. The other was Kent Pietsch in his Interstate Cadet whose display was similar to Brendan O'Brien's, but with a few tricks of his own. Bob Carlton put on a fantastic display in his Super Salto jet sailplane with a highly modified PBS TJ-100 jet engine, which showed exactly what you can do when you strap a jet engine to a glider. The most colourful aircraft displayed during the day was Rich Perkin's Aero Vodochody L-39C in it's striking red and yellow paint scheme. Joseph Shetterly brought along his fantastic home built Rifle Airshows RV-8, which in it's chrome finish looked stunning against the Arizona skies. 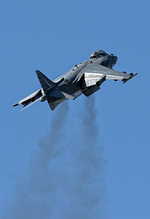 The Harrier was one of the main reasons, alongside the F-35B, for attending the show, and VMA-211 (Wake Island Avengers) didn't disappoint. The Squadron put on a superb high energy display showing off the AV-8B Harrier II, combining both high speed / high G passes alongside vertical take offs and landings. Greg Shelton provided the wing walking entertainment in his patriotic Super Stearman, with Samantha Albrecht on the wing for the first time. 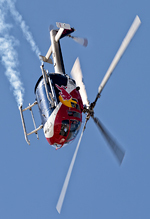 Chuck Aaron put on a great display in his modified Red Bull MBB Bo 105, performing manoeuvres I've only seen before done before by Army Air Corps Lynx Mark 7. The highlight of the day and finishing off the show was the first USMC public display of the F-35B from VFMA-121 (Green Knights). Unlike the Harrier, the STOVL Lightning II put on a very different, controlled display made up of both fast and slow passes. The sight of a 5th generation fighter with it's lift fan engaged and engine nozzle pointing down whilst in flight is an impressive sight. From a photographic perspective you need a focal length at least 400mm (on a full frame camera) for aircraft displaying along the display axis, as the displays could be quite distant at times. Shooting in the morning and early afternoon meant the sun was behind you, but by 15:00 the sun had moved round and you were starting to shoot into the sun when aircraft were approaching from the south. It's always nice to attend a show that has such a friendly feel to it, is well supported by the local community, has great food and is photographer friendly. Considering the show was up against El Centro and Luke AFB on the same day, the show had a good mix of both civilian acts and USMC assets.